Drive time calculator - how to use it? 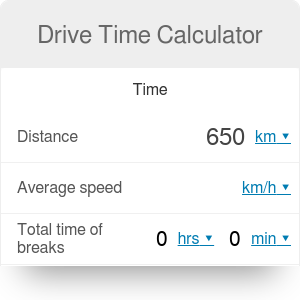 Drive time calculator - also known as travel time calculator, is our smart tool created exclusively for drivers. It helps you find out the estimated time of arrival (ETA) at your car trip destination and determine the fuel costs of the journey. So, if you are planning a vacation trip with friends in a seaside resort or would like to estimate the travel time to home by car, check out our drive time calculator! Estimated time of arrival (ETA) is the time when a vehicle, ship, aircraft or cargo is expected to arrive at a certain place. For example, a certain cruise bus may have an ETA calculated based on the expected average speed on the particular road. The travel distance is simply divided by the speed to roughly estimate the arrival time. This method does not take into account any unexpected events (such as car accidents on the road or bad weather conditions) which may occur on the way to the drive destination. Our travel time calculator assesses your total car drive time and estimated time of arrival (date & time). Also, in the "Money" section, you find out the total cost of a drive and exact cost per person. Let's assume that we are driving back home with friends from winter vacation in the mountains. Now, we want to know, how much this journey will cost us? With our drive time calculator, the answer to this question is very simple! We have also a great tool called traffic density calculator that helps you analyze the traffic on any road. Check out the gas calculator too, if you need to estimate only just cost of fuel for a drive. Drive Time Calculator can be embedded on your website to enrich the content you wrote and make it easier for your visitors to understand your message.